SPOTLIGHT: When an environmental campaign grows stale, public enthusiasm must be reignited. BIG PICTURE: For much of the past 30 years, greenhouse gases have been public enemy #1. Activists have spun emotionally-charged tales about the bleak future awaiting our children and grandchildren (just as Paul Ehrlich did while promulgating the overpopulation scare 20 years before). Climate collapse is imminent. Rather than falling, the sky is threatening to burst into flame. Humanity’s last chance to repent, to amend our sinful ways, is upon us. But no matter how anxious we feel about the climate, ordinary people’s first priority is the here and now. Fossil fuels heat and cool our homes, hospitals, schools, and workplaces. They make it possible to safely store and cook fresh food. They enable us to get our kids to swimming lessons, visit our elderly relatives, and attend church. In short: they power our lives and won’t be disappearing soon. Thirty years is a long time to bang on about a single topic. Which leaves the multi-billion-dollar industry known as environmental activism in a pickle. A 2017 list of US charities reveals that the Nature Conservancy had annual revenues of $818 million, the World Wildlife Fund $309 million, Conservation International $211 million, and the Environmental Defense Fund $171 million. 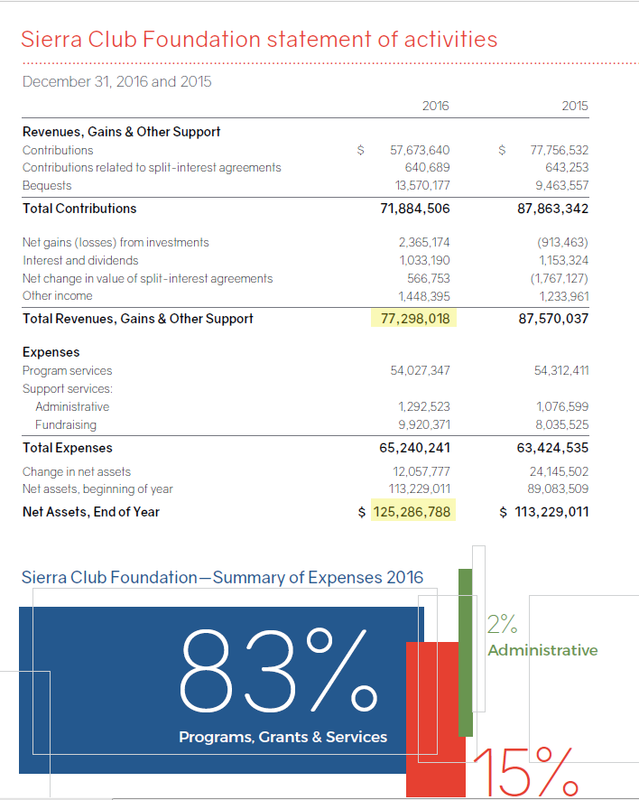 The Sierra Club had $77 million, and Greenpeace $38 million. Together, these numbers add up to $1.6 billion. For a single year in a single country. Below is a list of what the highest earner at each of those ‘charities’ got paid. It’s worth keeping in mind that anyone making more than $500,000 is a member of America’s top 1%. Relatively speaking, Greenpeace is small fry. But it still pays its Executive Director $113K for a 20-hour work week, has an Interim Campaigns Director who’s paid $172K, a Global Director of Digital Innovation who earns $177K, and a Director of Public Outreach who earns $189K (see pages 7-8). Bottom line: these organizations are big business. In structure, they’re similar to any other corporation. This is a world of org charts, perks, and internal jockeying for prestige. With the public having grown weary of the climate discussion, a new cause is required if donations are to keep flowing. As other observers have noticed, plastic is the new green obsession. The UK Prime Minister is waging “war on plastic waste.” Here in Canada, our publicly-funded broadcaster is airing insipid television news coverage of 10-year-olds campaigning against disposable straws. Never mind that the vast majority of the plastic that ends up in the ocean appears to come from eight rivers in Asia plus two in Africa. Never mind that there’s a straightforward explanation for this: poor countries can’t afford proper waste disposal (see here, here, and here). Never mind that $1.6 billion a year would go a long way toward assisting these countries. Instead, plastic is the new demon. Green groups need to pay those expensive salaries, and politicians and members of the public want to believe they’re supporting important environmental action. It’s all a bit tedious. But like previous green campaigns, it’s going to cost money and will spawn new laws and new regulations. TOP TAKEAWAY: Too many people’s livelihoods depend on there being an environmental crisis. The specifics vary over time, but the playbook stays the same. some related commentary: Were Aerosol Spray Cans Really a Threat? This entry was posted on June 8, 2018 by Donna Laframboise in Greenpeace, money & funding, NGOs, World Wildlife Fund and tagged Conservation International, Environmental Defense Fund, Greenpeace, Nature Conservancy, plastic, Sierra Club, WWF.